Many men admit to using physically aggressive behaviors against their partners. However, there is little evidence that men are as harshly injured as the female victims of male violence. Men who abuse their wives may be extremely jealous and may limit their wife’s activities or relationships or excessively control the family‘s finances. Abusive behavior also includes psychological abuse, such as threats of violence or verbal put-downs. Sexual assaults are commonly reported among women who have been critically abused by their partners. When an abusive husband pleads for help with his destructive ways, it is an important signal that the abusive husband wants to mend his ways. This is often, a good sign that he is turning over for the better. However not all cases of domestic abuse have happy endings. The statistic from the National Coalition Against Domestic Violence is astounding – one out of four women will be falling prey to domestic violence in her lifetime. Some women who have just come out of a relationship with an abusive husband normally are just dying to get into another relationship as soon as possible. Many feel they have been psychologically alone for a very long time and indeed they have. Unfortunately, getting into another relationship too soon is not always wise. These women have not had time to do some soul-searching and are putting themselves at risk of falling into the same trap of abuse again. According to an abuse poll of over 7,000 women conducted by WomanSavers.com, over 55% of women have been sexually abused at some point in their lives. 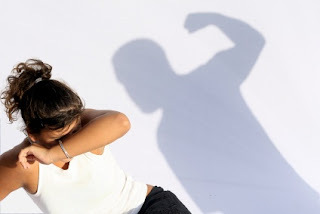 Frequently, if abuse occurs during childhood, women tend to marry abusive husbands thus repeating their abuse patterns. Behavior changes gradually, not just for the abuser but for the women as well. If you already have your eye on some guy and are afraid you’ll lose him, don't be. If the feeling is mutual, he’ll wait and allow you time to heal. Do not allow yourself to get desperate and jump from the frying pan into the fire! Now you have time to take care of yourself and work on things like rebuilding your self-esteem and learning how to prevent yourself from entering another abusive relationship. If you need help, ask for it. Jumping into an intimate relationship is not the answer, but how else can you develop a support network if you don’t already have one? Seek out help from family, friends, co-workers, counselors, or through the many resources available on the Internet. To add some enthusiasm into your life, start making a new list. Get a big sheet of paper and write words on it like “my job is…” “I live in.” Think about what you want and write it down. Get pictures from magazines, draw sketches, and look at it every day. This helps it become a reality. Then start planning how you can achieve those things. The best thing is to write it all down like it has already happened. Do not say, “I want to live in Atlanta with my family.” Say, “I now reside in Atlanta with my family.” That way it’s not some desire that may or may not be fulfilled. It is a statement of reality, a reality that will be. Make a new list of goals, allow your imagination to run wild, get excited, and know it can happen. Once you had a dream to be free from abuse and…. now you are. So learn to trust yourself. The key to recovery is to trust yourself, your instincts and your heart.